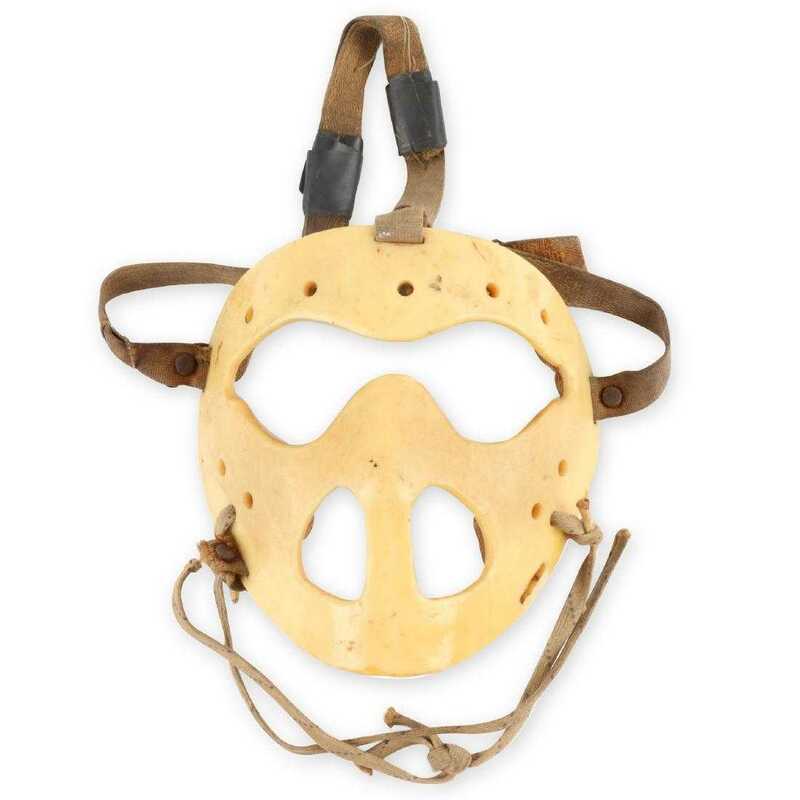 Miller & Miller Auctions upcoming February 9 sale includes Canadian treasures, such as a 19th century Morton & Company water cooler, a practice mask worn by hockey legend Jacques Plante and a circa 1890 canoe. 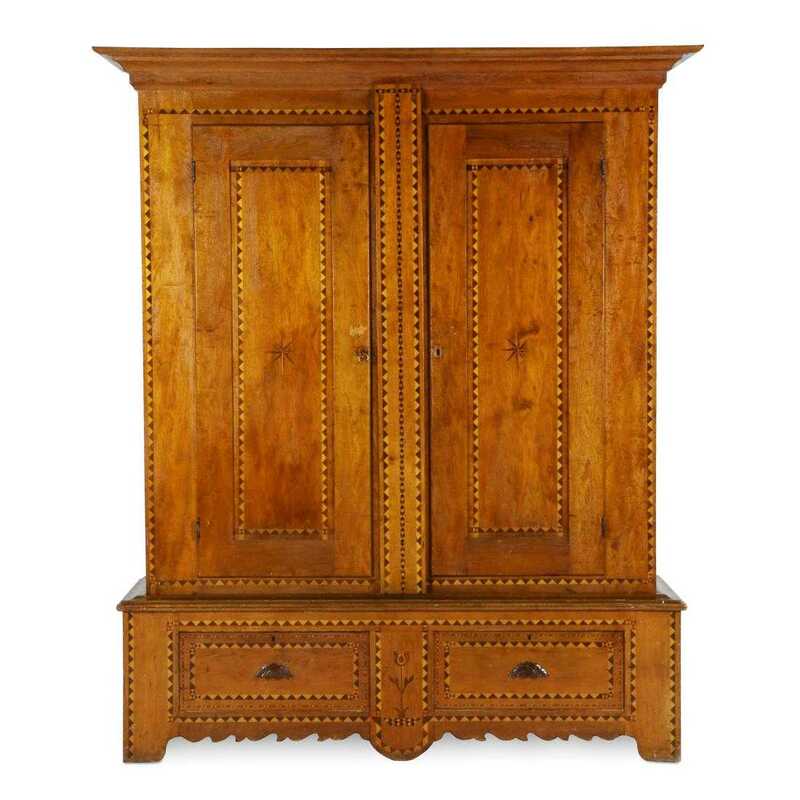 Schrank is a Pennsylvania Dutch term for a two-door clothes cabinet, one side having drawers and shelves, the other side an open space for hanging clothes. Examples in the auction include one tulip-inlaid masterpiece made in Upper Canada (Hanover or Gray County) in the second half of the 19th century and attributed to John Klempp (est. $9,000-$12,000); and one made in the 1860s in Waterloo County, Canada (est. 2,000-$3,000), for Joseph Hergott. (all prices quoted are in Canadian dollars). The early 1850s Morton & Company water cooler, made by Justus Morton in Brantford, Ontario, is elaborately decorated with applied figures including a man wrestling with lions with fish-like heads, a man smoking a pipe, a woman taking snuff and others with Greek, Roman or biblical origins, unusual for utilitarian pottery. Morton left Lyons New York in 1849 to found Canada’s first stoneware factory. The 12-inch-tall water cooler should hit $15,000-$18,000. The circa 1960 practice mask allegedly used in practice by Jacques Plante was never used in an actual NHL game. In a 1963 legend confirmed by Boston Bruins’ John Ferguson, Jr., Plante, upon hearing the news he’d been traded from the Montreal Canadians to the New York Rangers, emptied the contents of his locker in the trash. Teammate John “Fergie” Ferguson, Sr. salvaged the trash, including the mask (est. $9,000-$12,000). 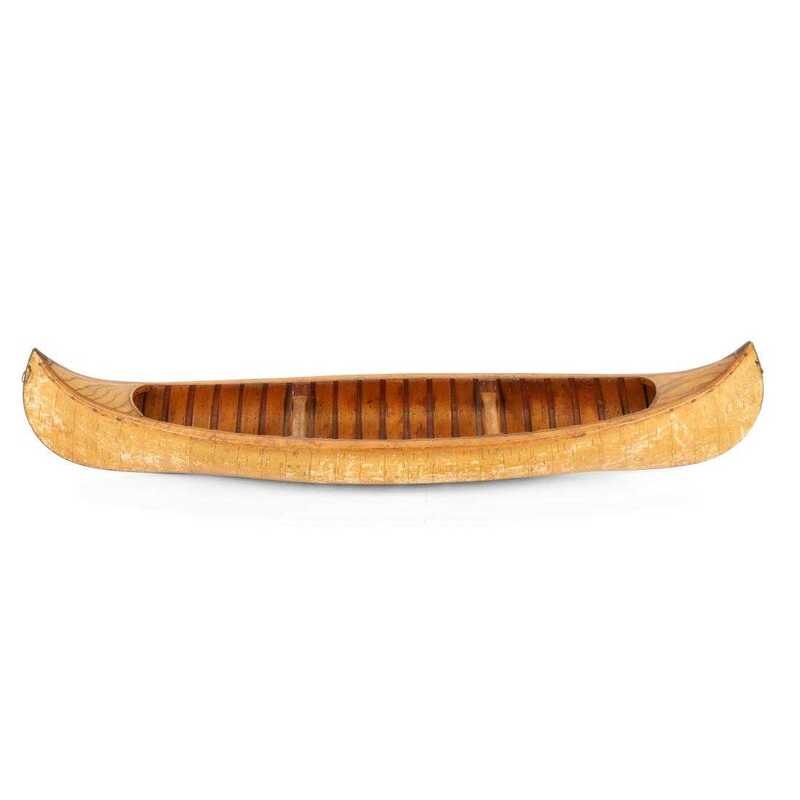 The miniature canoe, made around 1890 and attributed to John Stephenson (Peterborough, Ontario), is one of only four known “sample models” attributed to Stephenson, known as the “grandfather of the Peterborough canoe”. His groundbreaking experimentation with canvas, textile and bark veneer coverings was decades ahead of his time. The canoe is expected to hammer for $9,000-$12,000. Circa 1890 “sample model” miniature canoe attributed to John Stephenson (Peterborough, Ontario), known as the “grandfather of the Peterborough canoe” (est. CA$9,000-$12,000). 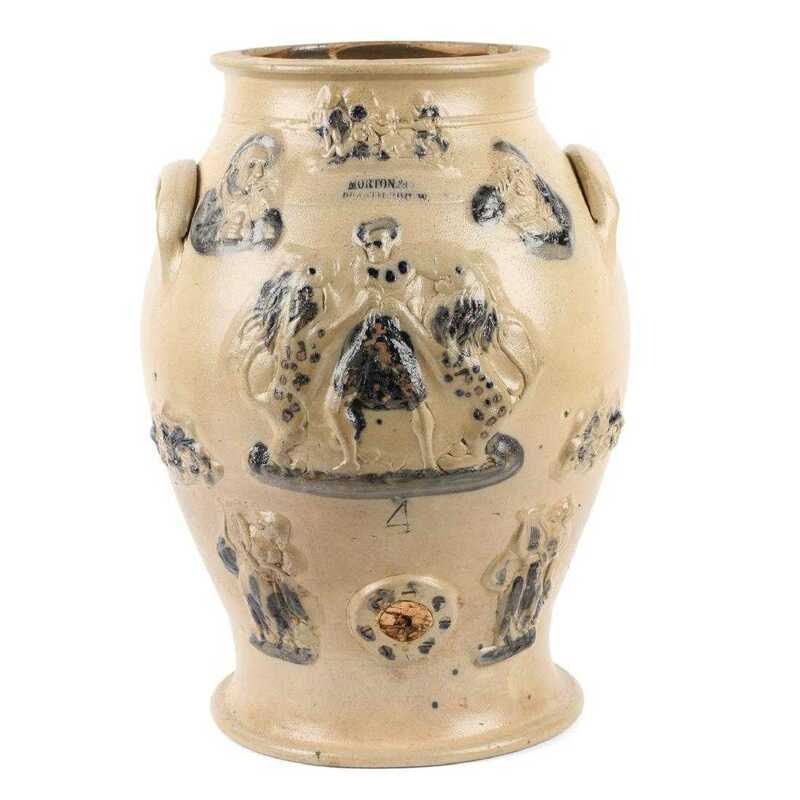 A candidate for top lot of the auction is an Egmondville master stein, one of the few advertising objects to surface in early Canadian pottery. 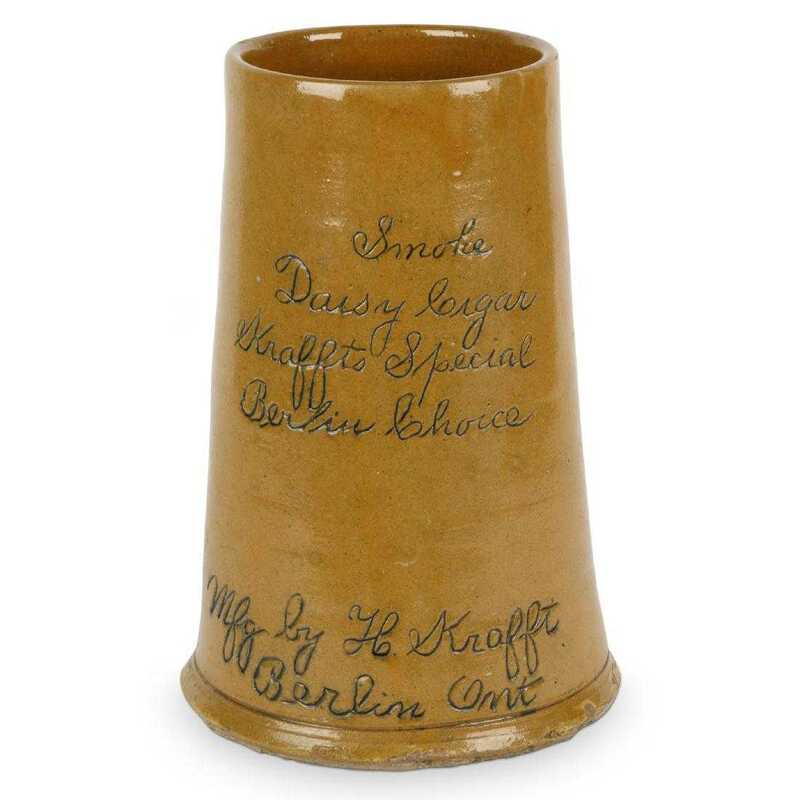 The 11 ¾-inch-tall clay stein reads, “Smoke Daisy Cigar, Kraffts Special, Berlin Choice” and beneath, “Mfg by H. Krafft Berlin Ont” (est. $14,000-$16,000). Egmondville clay master stein, one of the few advertising objects to surface in early Canadian pottery, 11 ¾ inches tall and reading, “Mfg by H. Krafft Berlin Ont” (est. $14,000-$16,000). A spectacular, early Canadian architectural open dish cupboard, made in the 1840s or 1850s by Lunenburg (Nova Scotia), 84 ½ inches in height, borrowing elements of the Germanic tradition, having three drawers/two doors, has an estimate of $6,000-$9,000. Also, an honest, elegant and well-formed early Markham County dish dresser manufactured around 1850, having early lap drawers above two thick doors and the excellent original surface, should garner $4,000-$6,000. A monumental, English tall case clock with moonphase dial signed “Ryrie Birks, Toronto”, 104 inches tall, complete and functioning, with correct eight-bell, three-weight-driven movement, is estimated to bring $4,000-$6,000. A pair of advertising lots have identical estimates of $2,000-$3,000. One is a rare early Canadian railroad poster signed “Toronto Lithographing Co” and titled “The Globe Special Train, Passing Dundas”. 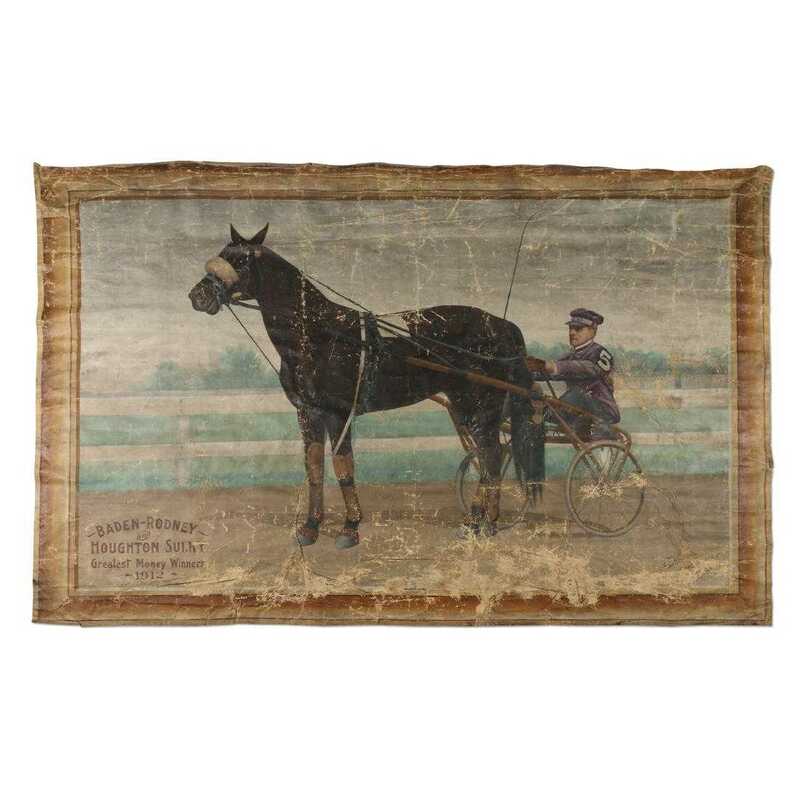 The other is a 1912 horse racing carts advertising banner (saying “Baden-Rodney and Houghton-Sulky / Greatest Money Winners / 1912”), signed “J.F. 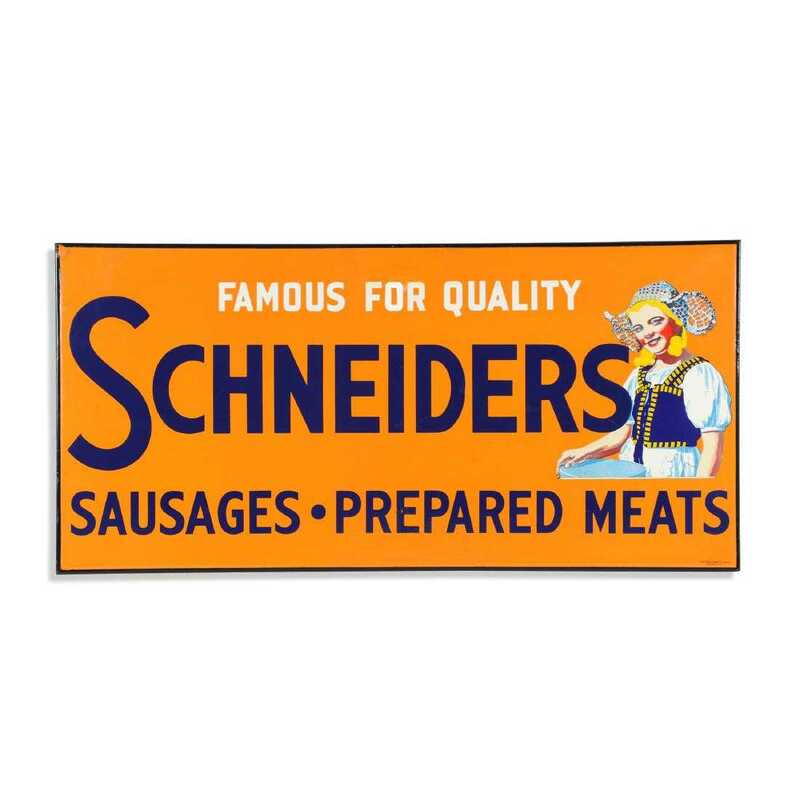 Harvey / Amsterdam, N.Y.” Also, a rare, Canadian-made 1930s-era Schneider’s porcelain sign boasting an early version of the iconic ‘Dutch Girl’ graphic and with superb color and gloss, 22 ½ inches by 46 ½ inches, should hit $3,000-$5,000. 1912 horse racing carts advertising banner (“Baden-Rodney and Houghton-Sulky / Greatest Money Winners / 1912”), signed “J.F. Harvey / Amsterdam, N.Y.” (est. CA$2,000-$3,000). Collectors love old Canadian license plates. 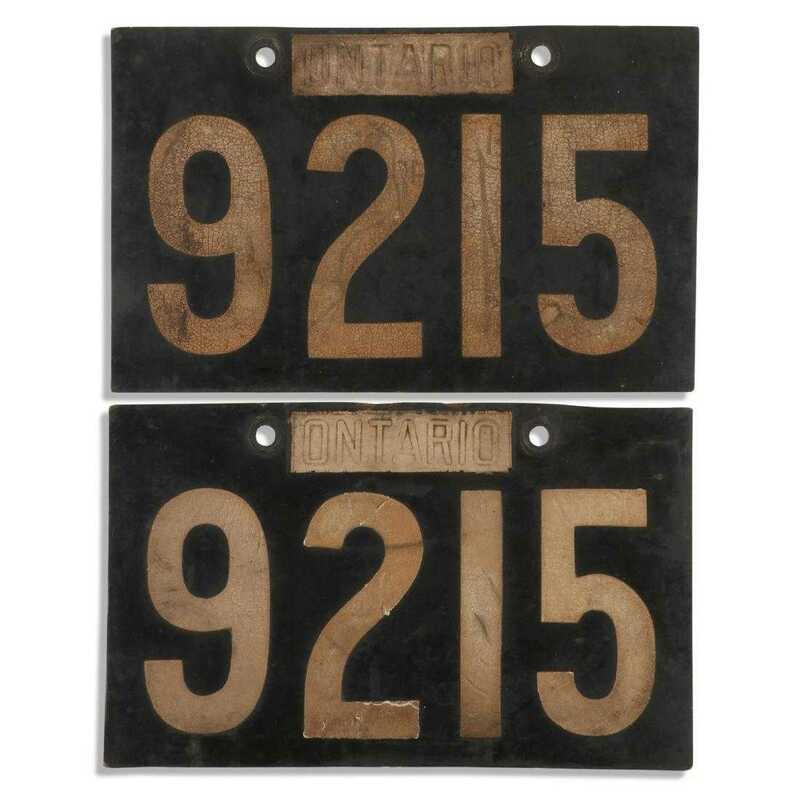 The auction boasts an intact run of early Ontario license plates, including two lots with $3,000-$5,000 estimates. One is for a pair of 1910 rubber Ontario plates, with serial number “9215”, each one 11 ¾ inches by 7 ¼ inches, with no cracks. The other is a pair of Ontario temporary plates from 1916, rare and made from cloth-bound cardboard because of the metal shortages of World War I. Pair of 1910 rubber Ontario plates, with serial number “9215”, each one 11 ¾ inches by 7 ¼ inches, with no cracks (est. CA$3,000-$5,000). 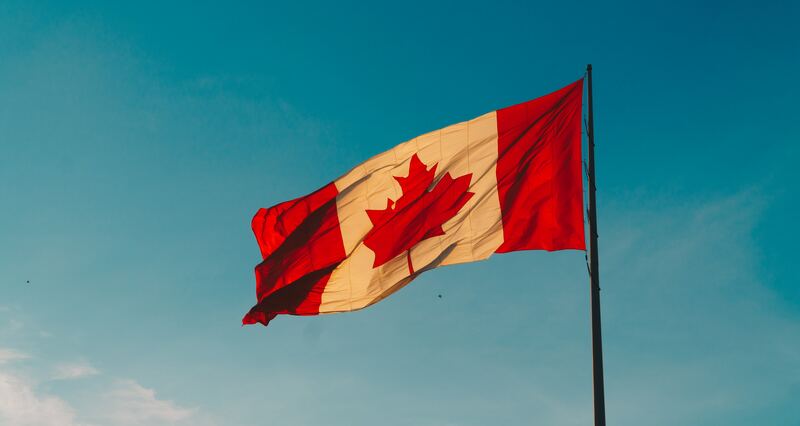 To consign a single piece, an estate or a collection, you may call them at (519) 573-3710 or (519) 716-5606; or, you can send an e-mail to info@millerandmillerauctions.com. To learn more about Miller & Miller Auctions, Ltd. and the Feb. 9 auction, visit www.MillerandMillerAuctions.com.